President Trump and First Lady Melania Trump made history on Wednesday as the first First Couple to travel together to meet the troops in Iraq war zone. President Trump fired up the troops at Al Asad Air Base in Iraq. President defended his decision to remove troops in Syria and said the US can use its base in Iraq to hit the terrorists. 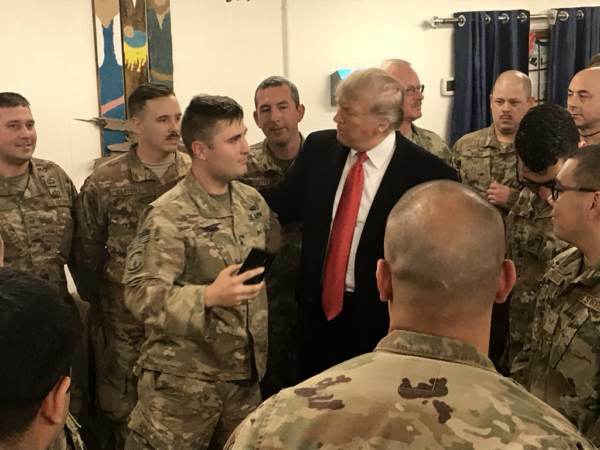 President Trump took time meeting the troops and also signed at least one Make America Great Again hat at the Iraqi base. The troops chanted, “USA! USA! USA!…” when President Trump and Melania Trump took the stage today.